Etty Ben Zaken – Steinberg studied singing at the Jerusalem Rubin Academy and theater at the School of Visual Theater, Jerusalem. She won audience and critical acclaim for her performances and recordings of contemporary works, some of which were written especially for her voice. 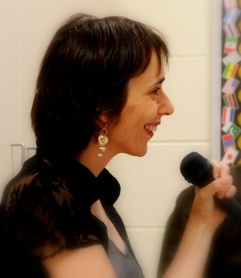 Well versed in the extended vocal techniques of 20th-century music, she feels equally at home performing early music and folk repertoire from her Sephardic heritage. A unique renaissance woman, she is also a prolific creator. Two novels by her have been published in Israel and five Music-Theater shows which she has staged, designed and performed, have taken part in festivals in Israel, Europe and the USA. These shows were created in collaboration with her husband, composer Eitan Steinberg, whose music she frequently performs. Ben-Zaken’s singing has been recorded on the New Albion Records label, Israeli TV and radio, German WDR radio and on documentary films. Ben-Zaken is an active lecturer on ethnic and contemporary music, and a faculty member at Haifa University’s Theater Department.